While a burst pipe is an immediate call to action, a stain on the ceiling is a subtle lingering reminder that something is wrong in your house. Instead of avoiding it, here are some facts to get you up to go investigate! Whether it’s the roof or an upstairs bathroom, whatever is above the ceiling is usually the source of the stain. Pipes might run along attic rafters before dropping right above your ceiling, so tracking the original source might take some detective legwork. Even if your ceiling does not look too bad now, it doesn’t take much water to create a disaster. A red flag that your ceiling is at risk of failure are depressions around the fasteners; you will see tiny dimples forming on the ceiling because the drywall encompassing the nails or screws droops, leaving an inverted crater. The most obvious consequence of a leak up in the roof is a compromised structure due to damaged rafters, ceiling joists, wall framing or exterior trim. Chronic wet wood leads to deterioration and rot. High utility bills could be another side effect of a leak; water intrusion destroys the insulation in the attic area. Cellulose or fiberglass insulation becomes saturated and the insulating properties are lost. If a roof leak repair is put off for a long time, your home will lose hot and cool air and your will pay higher utility bills. If you paint or cover up the damage, you may create a bigger problem. If the water continues to seep or leak, you may need to tear out the portion of the freshly patched ceiling to address the real source. If mold spores are not killed, then mold will come back. Again, an experienced professional will be able to make a much less visible repair than an inexperienced homeowner. 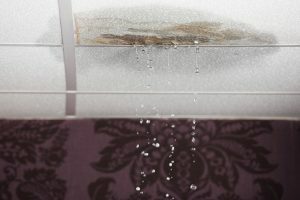 Don’t ignore signs of water damage on the ceiling– or anywhere in your house! Total Restoration water technicians are certified in water (restoration) removal by the Institute of Inspection Cleaning and Restoration Certification (IICRC). They (immediately and thoroughly) extract the water from the affected area of your home or business and the resulting damage is evaluated. Finally, Total Restoration will identify and create solutions that minimize or eliminate the chance of future occurrences. When the team is finished, you will have a dry, clean and safe environment again. Total Restoration in Indianapolis provides 24-hour emergency services to help commercial and residential property.